Knees need a little more support to finish a workout? 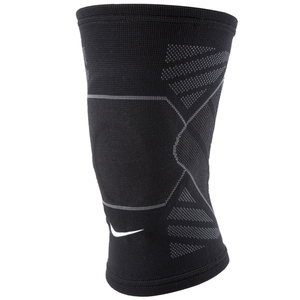 Don’t sweat it, the Nike Advantage Knitted Knee Sleeve provides compression and support in breathable material. 60% Nylon, 20% Polyester, 20% Rubber. 4-way stretch knitted knee sleeve provides compression and support to the knee. Breathable knit design releases excess heat while still keeping the joints warm for optimal performance. EVA foam pads provide targeted support where most needed. Zoned stretch-knit allows for better mobility and zero distractions during your workout.